NOTE: This article demonstrates how F# in conjunction with Reactive Extensions can be used to connect to live data streaming. The full project with example client can be found at This Github link. I do not take any responsibility of the code and any damages caused by it. Code which is provided AS IS is only for demonstration purposes and in no way encourages anyone to use Google Finance API for business. The simple finance API by Google is just a URL that takes symbol in 'q' GET parameter (or query string parameter). The following will give you the current price data for Yahoo in Json format. It creates a thread using TaskFactory which queries Google Finance every 1 second, fetches the price and if there is a change in price produces the output into the Observable. 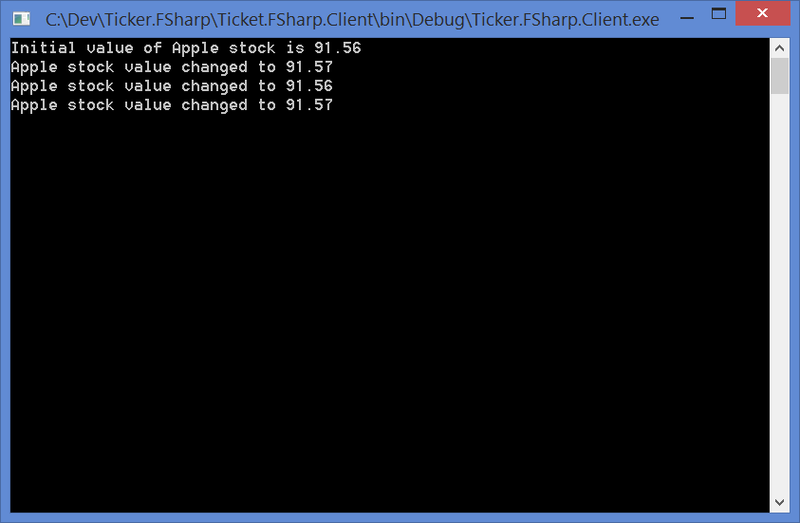 Google Finance API gives back Json object. I am using Json.Net library by James-Newton King to parse that. Remember to add Rx-Main and Json.Net from Nuget in your project and add appropriate 'open' declarations for namespaces. The fully functional project with sample client for this project can be found at This Github link. Let me know your comments in the section below. If there is anything that I should have done differently, I would love to hear about that.